Francesinha is a Portuguese sandwich that is served in a dish and eaten with a knife and fork. It’s mostly served in the city of Porto and consists of two slices of bread that contain ham, linguiça (a type of smoked pork sausage), chipolata sausage, and a slice of steak. The sandwich is topped with a melted cheese sauce and a fried egg (optional). The last thing to be added is a sauce that consists of tomato and beer. The sandwich is sometimes served with chips, but it may also be served without chips, depending on the establishment providing it. The Francesinha is believed to have been invented during the 1960s by a man called Daniel da Silva, who’d recently returned to Portugal after an extended stay in France. During his time abroad, Daniel had eaten the French toasted bread dish croque monsieur. On his return to the Altentejo region of Portugal, he tried to produce a version that would be a good fit for the culinary tastes of Portuguese people. Daniel’s invention failed to impress. However, he later moved to the city of Porto, where his francesinha received a much better reception. I had my Francesinha with an egg on top. To be honest, I enjoyed the egg more than the sandwich below it. Chips weren’t included, but had they been I think they would have been spoiled by the juice in the bottom of the dish. The first thing I had a problem with was the cheese. Every time I cut into the sandwich and tried to raise a piece to my mouth, it was very hard to sever the strands of cheese that stretched between the piece of francesinha on my fork and the portion in my dish. This is definitely not a dish anyone would want to choose on a date because it’s a little too messy to eat and all that gooey cheese hanging from the mouth would not look good at all. I can’t say I cared for the taste either. It wasn’t so much a combination of flavours as a clash of flavours. There was one flavour that appeared to dominate the others for quite a while. It was familiar, but I couldn’t place it. Then, as the sandwich fell apart towards the end, I saw long, thin slices of hot dog-like sausage and realized what the flavour was. The juice was a problem for me too. It was very thin. More like water than a soup or a sauce. It made the bread soggy. That was my first Francesinha and it will be my last. 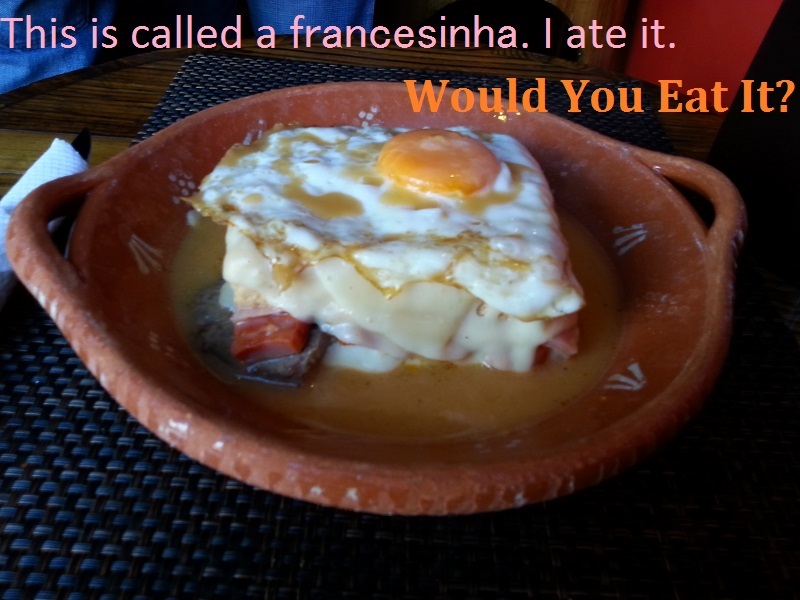 I’m glad I tried it, and I’m sure a lot of people will enjoy their Francesinha more than I did. If I’m going to eat a dish that involves bread, I’d much rather have a Dutch Uitsmijter.